Over the past few weeks I have demonstrated how to compile OpenCV 3 on macOS with Python (2.7, 3.5) bindings from source. Compiling OpenCV via source gives you complete and total control over which modules you want to build, how they are built, and where they are installed. All this control can come at a price though. The downside is that determining the correct CMake paths to your Python interpreter, libraries, and include directories can be non-trivial, especially for users who are new to OpenCV/Unix systems. It turns out, there is — just use Homebrew, what many consider to be “the missing package manager for Mac”. So, is it really that easy? Just can a few simple keystrokes and commands can be used to avoid the hassle and install OpenCV 3 without the headaches? Well, there’s a little more to it than that…but the process is greatly simplified. You lose a bit of control (as compared to compiling from source), but what you gain is an easier to follow path to installing OpenCV on your Mac system. 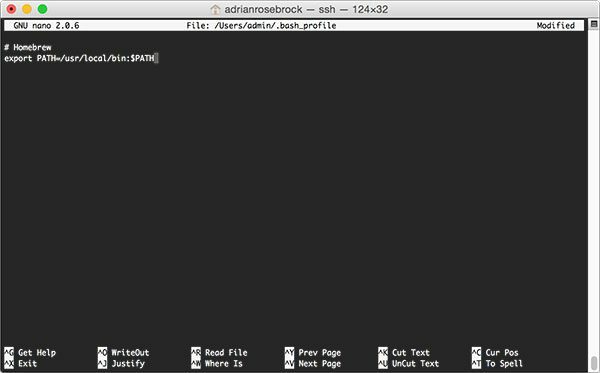 To discover the easy way to install OpenCV 3 on macOS via Homebrew, just keep reading. 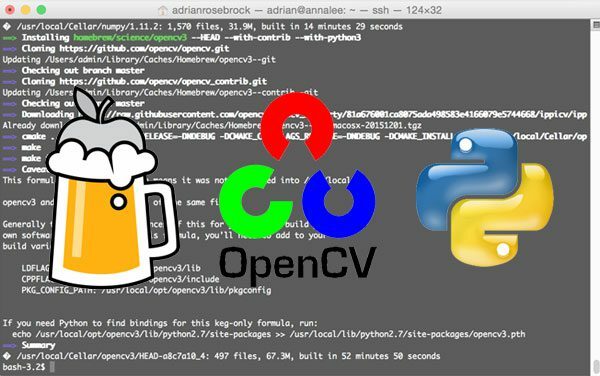 The remainder of this blog post demonstrates how to install OpenCV 3 with both Python 2.7 and Python 3 bindings on macOS via Homebrew. The benefit of using Homebrew is that it greatly simplifies the install process (although it can pose problems of its own if you aren’t careful) to only a few set of commands that need to be run. Before we can install OpenCV 3 on macOS via Homebrew, we first need to install Xcode, a set of software development tools for the Mac Operating System. Figure 1: Downloading and installing Xcode on macOS. Depending on your internet connection and system speed, the download and install process can take anywhere from 30 to 60 minutes. 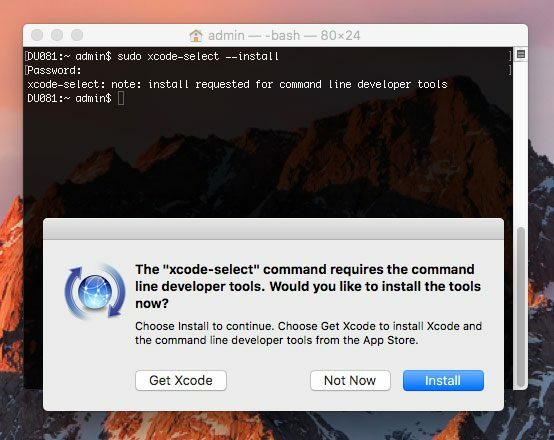 I would suggest installing Xocde in the background while you are getting some other work done or going for a nice long walk. Scroll to the bottom of the license and accept it. 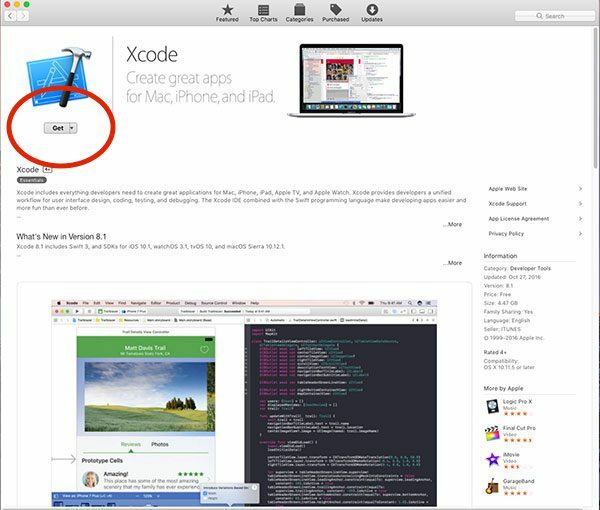 If you have already installed Xcode and previously accepted the Apple developer license, you can skip this step. Figure 2: Installing Apple Command Line Tools on macOS. Simply click the “Install” button to continue. The actual install process of Apple Command Line Tools should take less than a 5 minutes. We are now ready to install Homebrew, a package manager for macOS. You can think of Homebrew as the macOS equivalent of the Ubuntu/Debian-based apt-get. Now that Homebrew is successfully installed and updated, we need to update our ~/.bash_profile file so that it searches the Homebrew path for packages/libraries before it searches the system path. Failure to complete this step can lead to confusing errors, import problems, and segfaults when trying to utilize Python and OpenCV, so make sure you update your ~/.bash_profile file correctly! All this snippet is doing is updating your PATH variable to look for libraries/binaries along the Homebrew path before it searches the system path. After updating the ~/.bash_profile file, save and exit your text editor. Figure 3: Updating my .bash_profile file to include Homebrew. Remember, your ~/.bash_profile may look very different than mine — that’s okay! Just make sure you have included the above Homebrew snippet in your file, followed by successfully saving and editing the editor. The above command only needs to be executed once. 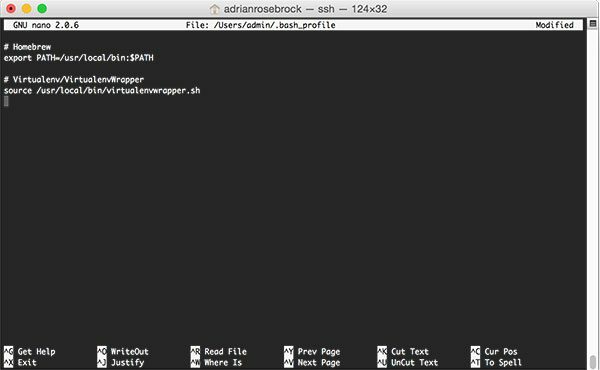 Whenever you open up a new terminal, login, etc., your .bash_profile file will be automatically loaded and sourced for you. The next step is to install the Homebrew versions of Python 2.7 and Python 3. It is considered bad form to develop against the system Python as your main interpreter. The system version of Python should serve exactly that — system routines. At the time of this writing the current Python versions installed by Homebrew are Python 2.7.12 and Python 3.5.2. Inspect the output of which closely. If you are see /usr/local/bin/python and /usr/local/bin/python3 for each of the paths then you are correctly using the Homebrew versions of Python. However, if the output is instead /usr/bin/python and /usr/bin/python3 then you are incorrectly using the system version of Python. Go back to Step #2 and ensure Homebrew installed without error. Check that brew install python python3 finished successfully. You have correctly updated your ~/.bash_profile file and reloaded the changes via source . Your ~/.bash_profile should look similar to mine in Figure 3 above. In particular, pay attention to both the major and minor version numbers. For the first command, my major Python version is 2 and the minor version is 7. Similarly, for the second command my major Python version is 3 and the minor version is 5. The reason I bring this up is because file paths can and will change based on your particular Python version numbers. 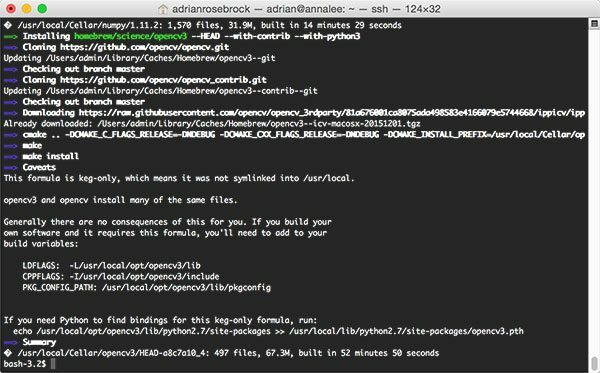 The instructions detailed in this tutorial will successfully install OpenCV via Homebrew on your macOS machine provided you pay attention to your Python version numbers. Forgetting to check and validate file paths is a common mistake I see readers make when trying to install OpenCV on their macOS machines for the first time. Do not blindly copy and paste commands and file paths. Instead, take the time to validate your file paths based on your Python version numbers. Doing so will ensure your commands are correctly constructed and will help you immensely when installing OpenCV for the first time. Now that we have installed the Homebrew versions of Python 2.7 and Python 3 we are now ready to install OpenCV 3. To install OpenCV on our macOS system via Homebrew we are going to use the brew install command. This command accepts the name of a package to install (like Debian/Ubuntu’s apt-get), followed by set of optional arguments. The base of our command is: brew install opencv3 ; however, we need to add some additional parameters. --with-contrib : This ensures that the opencv_contrib repository is installed, giving us access to additional, critical OpenCV features such as SIFT, SURF, etc. --with-python3 : OpenCV 3 + Python 2.7 bindings will be automatically compiled; however, to compile OpenCV 3 + Python 3 bindings we need to explicitly supply the --with-python3 switch. For those who are curious, the Homebrew formulae (i.e., the actual commands used to install OpenCV 3) can be found here. Use the parameters above and the install script as a reference if you want to add any additional OpenCV 3 features. We are now ready to install OpenCV 3 with Python bindings on your macOS system via Homebrew. Depending on the dependencies you do or do not already have installed, along with the speed of your system, this compilation could easily take a couple of hours, so you might want to go for a walk once you kick-off the install process. This command will install OpenCV 3 on your macOS system with both Python 2.7 and Python 3 bindings via Homebew. We’ll also be compiling the latest, bleeding edge version of OpenCV 3 (to avoid any QTKit errors) along with opencv_contrib support enabled. There was recently an update to the Homebrew formula used to install OpenCV on your macOS machine that may cause two types of errors. Then be sure to refer to this updated blog post where I provide solutions to both of the errors. As I mentioned, this install process can take some time so consider going for a long walk while OpenCV installs. However, make sure your computer doesn’t go to sleep/shut down while you are gone! If it does, the install process will break and you’ll have to restart it. 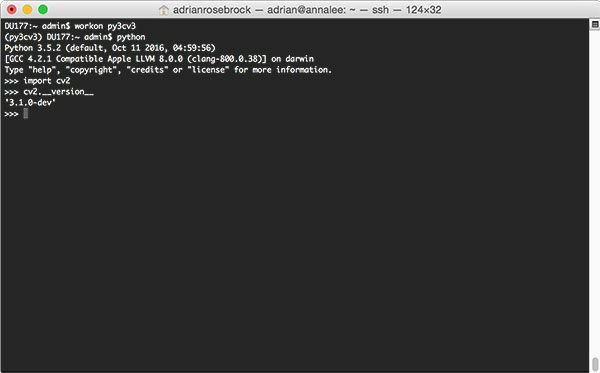 Figure 4: Compiling and installing OpenCV 3 with Python bindings on macOS with Homebrew. However, we’re not quite done yet. The above command creates a .pth file which tells Homebrew’s Python 2.7 install to look for additional packages in /usr/local/opt/opencv3/lib/python2.7/site-packages — in essence, the .pth file can be considered a “glorified sym-link”. At this point you now have OpenCV 3 + Python 2.7 bindings installed! However, we’re not quite done yet…there is still a few extra steps we need to take for Python 3. Remember the --with-python3 option we supplied to brew install opencv3 ? Well, this option did work (although it might not seem like it) — we do have Python 3 + OpenCV 3 bindings installed on our system. Note: A big thank you to Brandon Hurr for pointing this out. For a long time I thought the --with-python3 switch simply wasn’t working. I have no idea why the Python 3 + OpenCV 3 bindings are not named cv2.so as they should be, but the same is true across operating systems. You’ll see this same issue on macOS, Ubuntu, and Raspbian. At this point you now have both Python 2.7 + OpenCV 3 and Python 3 + OpenCV 3 installed on your macOS system via Homebrew. Figure 5: Confirming that OpenCV 3 with Python 3 bindings have been successfully installed on my macOS system via Homebrew. Congratulations, you have installed OpenCV 3 with Python bindings on your macOS system via Homebrew! But if you’re a longtime reader reader of this blog, you know that I use Python virtual environments extensively — and you should too. You’ll notice that unlike many of my previous OpenCV 3 install tutorials, Homebrew does not make use of Python virtual environments, a best practice when doing Python development. While Steps #5-#7 are optional, I highly recommend that you do them to ensure your system is configured in the same way as my previous tutorials. You’ll see many tutorials on the PyImageSearch blog leverage Python virtual environments. While they are indeed optional, you’ll find that in the long run they make your life easier. The virtualenv and virtualenvwrapper packages allow us to create separate, independent Python virtual environments for each project we are working on. I’ve mentioned Python virtual environments many times before on this blog so I won’t rehash what’s already been said. Instead, if you are unfamiliar with Python virtual environments, how they work, and why we use them, please refer to the first half of this blog post. I also recommend this excellent tutorial on the RealPython.com blog that takes a more in-depth dive into Python virtual environments. Figure 6: Update your .bash_profile file to include virtualenv/virtualenvwrapper. This command only needs to be executed once. Assuming that your ~/.bash_profile has been updated correctly, it will automatically be loaded and source ‘d each time you open a new shell, login, etc. We are now ready to use the mkvirtualenv command to create a Python virtual environment named cv (for “computer vision”). The -p switch controls which Python version is used to create your virtual environment. Please note that each virtual environment needs to be uniquely named so if you want to create two separate virtual environments, one for Python 2.7 and another for Python 3, you’ll want to make sure that each environment has a separate name — both cannot be named “cv”. 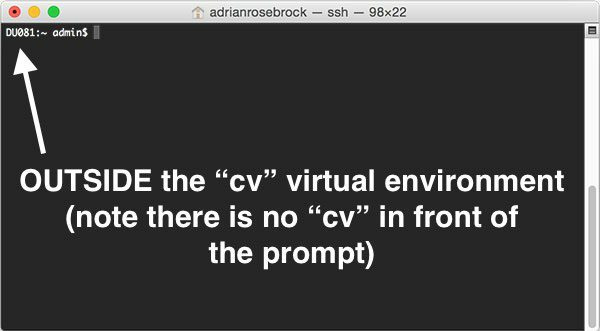 Figure 7: Make sure you see the “(cv)” text on your prompt, indicating that you are in the cv virtual environment. Figure 8: If you do not see the “(cv)” text on your prompt, then you are not in the cv virtual environment and you need to run the “workon” command to resolve this issue before continuing. 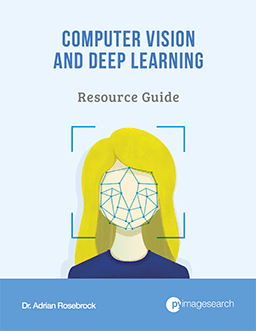 The only Python prerequisite for OpenCV is NumPy, a scientific computing package. We are now ready to sym-link in the cv2.so bindings into our cv virtual environment. I have included the commands for both Python 2.7 and Python 3, although the process is very similar. If you would like to have OpenCV 3 bindings installed for both Python 2.7 and Python 3, then you’ll want to repeat Step #5 and Step #6 for both Python versions. This includes creating a uniquely named Python virtual environment, installing NumPy, and sym-linking in the cv2.so bindings. Open up a new terminal window. Attempt to import your Python + OpenCV 3 bindings on macOS. Note that the above output demonstrates how to use OpenCV 3 + Python 2.7 with virtual environments. 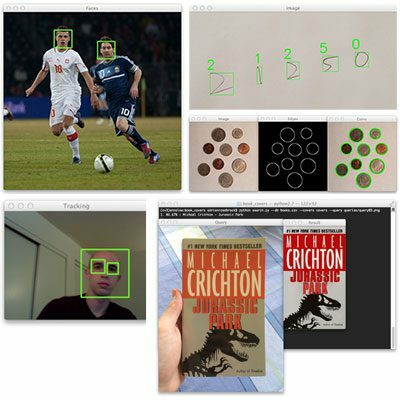 Figure 10: Utilizing virtual environments with Python 3 + OpenCV 3 on macOS. 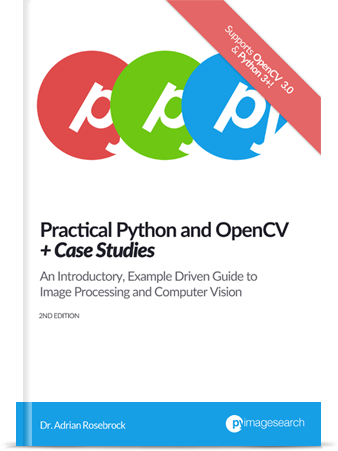 So, let’s put that fresh install of OpenCV 3 on your macOS system to good use — just click here to learn more about the real-world projects you can solve using Practical Python and OpenCV. In today’s blog post I demonstrated how to install OpenCV 3 with Python 2.7 and Python 3 bindings on your macOS system via Homebrew. As you can see, utilizing Homebrew is a great method to avoid the tedious process of manually configuring your CMake command to compile OpenCV via source (my full list of OpenCV install tutorials can be found on this page). The downside is that you lose much of the control that CMake affords you. Furthermore, while the Homebrew method certainly requires executing less commands and avoids potentially frustrating configurations, it’s still worth mentioning that you still need to do a bit of work yourself, especially when it comes to the Python 3 bindings. These steps also compound if you decide to use virtual environments, a best practice when doing Python development. First try to install OpenCV 3 via source. If you run into considerable trouble and struggle to get OpenCV 3 to compile, use this as an opportunity to teach yourself more about Unix environments. More times than not, OpenCV 3 failing to compile is due to an incorrect CMake parameter that can be correctly determined with a little more knowledge over Unix systems, paths, and libraries. Use Homebrew as a fallback. I would recommend using the Homebrew method to install OpenCV 3 as your fallback option. You lose a bit of control when installing OpenCV 3 via Homebrew, and worse, if any sym-links break during a major operating system upgrade you’ll struggle to resolve them. Don’t get me wrong: I love Homebrew and think it’s a great tool — but make sure you use it wisely. Anyway, I hope you enjoyed this blog post! And I hope it helps you get OpenCV 3 installed on their macOS systems. Thanks! This is super useful. FWIW, I’ve also been using the opencv-python  package. If the architectures, Python versions, and OS versions are supported, it’s a super easy alternative. Thanks for sharing Javier. I personally have not used the opencv-python package. I’ll look into this more. My biggest worry is that the opencv_contrib package isn’t installed by default. I can’t seem to find any mention of this in their GitHub repo? Yeah, it seems like unfortunately opencv_contrib is not there yet. I tried “opencv-python” before finding out this blog. I still recommend newcomers to install opencv from source, or through homebrew. opencv-python works by providing a precompile cv.so and the Python binding. It is fast and extremely convenient, but at the cost of the limitation of that cv.so. It will not have UI support, since it is not compiled with GTK on *your* computer. That may work for some people, when they know exactly what they need, and can work around the limitation. But for newcomers, it is better to grab everything, and save yourself a headache of finding out which is missing. Thank you for sharing Quang, I didn’t realize that “opencv-python” didn’t have UI support out of the box. I’ll also worth nothing that the “opencv_contrib” module is not included either. This works to get the compare-two-images example from 2014/09/15 running correctly on MacOS 10.11+, for example. Thanks for sharing Scott. 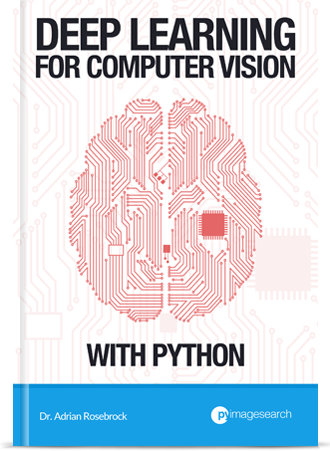 I’m not familiar with the opencv-python package, but I’ll check it out. As I mentioned to “Javier” above, I’m concerned with opencv_contrib isn’t installed by default, but I’ll look into this. Man! you are a genios, just save me a week of pain. n Step 7, I execute python and cv2.__version__ and the version returns 2.4.12. How do I update OpenCV to 3.1.0-dev? It sounds like you already have OpenCV 2.4.12 installed on your system. How did you previously install OpenCV 2.4? Via Homebrew? Or from source? I have the same problem, it says the version I installed is 2.4.12. The only thing I did differently was not include the –with-python3 when installing opencv3, but I don’t think that would cause this weird error. I did previously try to install opencv from the source on your other guide but ran into the QTkit error. 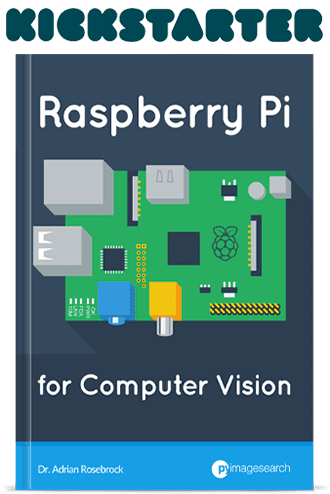 Did you have OpenCV installed on your system prior to running the steps in this tutorial? Thank you so much for giving such wonderful installation steps. But I have a problem after installation of opencv on my mac. That is I am not able to see the pixel values on the GUI and not even the X and Y coordinate points, after CV2 imshow. Can u please help me. I am banging my head into many website from past 1 week. Please help me. Just to be sure — are you calling cv2.waitKey after cv2.imshow? The cv2.waitKey call is required in order to see the window open up on your system. FWIW: I didn’t have to rename the python 3.5 opencv shared object file in order to successfully import cv2 in python3.5 and I didn’t need to create the .pth file either. Leaving the versioned file name alone the import still succeeded. Unless I need a more involved test? 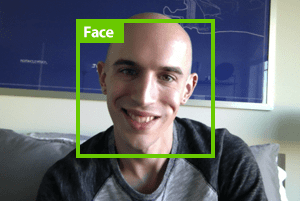 Thanks for sharing your experience Steve, congrats on getting OpenCV installed! Have you tried conda? conda is a cross-platform package manager (OSX, Windows, Linux). It provides a precompiled opencv package. I never tried this package specifically, but I highly recommend conda when working with compiled libraries. I’ve used conda in the past and found it reasonable. I might still use it today, but the parent company (Continuum) responsible for conda had a very large falling out over a business deal when I was creating the PyImageSearch Gurus course. It’s a great tool, but I’d caution you regarding their OpenCV support — they have removed it in the past and have only recently added it back in over the past couple of years. It is a community-driven initiative to provide conda packages and it has almost all packages provided by Continuum, so it is probably less risky now. Anyone try to download https://codeload.github.com/opencv/opencv/zip/3.2.0 recently? Just timing out for me (Jan.1 2017) despite status.github.com saying all systems running. The link seems to be working with me. This was a breeze! I’ve spent *days upon days* trying to get OpenCV installed before finding this tutorial. Installing this way took me about an hour. Amazing. Note that the latest version of Python is now 3.6 so if you’re copy-pasting Adrian’s code, you might need to replace any instances of 3.5 with 3.6. Articles like this really helps us noobs actually get into the environment. As Tori has already said, I had to change all the 3.5 for 3.6 (and for “Handling the Python 3 issue” in step 4, cv2.cpython-35m-darwin.so became cv2.cpython-36m-darwin.so), to accommodate Python 3.6.
whereas in this tutorial, only the first line was mentioned. This fixes finding the binding for Python 2.7, and for 3.6, I ran the same 3 lines except with 3.6 in the place of 2.7 . I could not get the Homebrew version of Python to work. Then I found out about brew doctor. Can you explain how you got yours to work? I’m struggling here, installing on a MacBook Pro on OSierra. I keep getting an ImportError. What did you do with brew doctor? In my terminal I write: “ls -l /usr/local/opt/opencv3/lib/python3.5/site-packages/” like you said, but my output is saying “no such file or directory”. Hey Andy — are you sure you’re using Python 3.5? You might be using Python 3.6. Another suggestion is to check whether the cv2.so file is in the site-packages or the dist-packages. Thanks for the tutorial! It worked perfectly for Python2.7 and also for Python 3.5. But I encountered the same problem as Andy with Python3.6, no *.so file in site-packages directory. It seems coming from 3.6 since with 3.5 it worked. Any idea where it may come from? I haven’t tried with Python 3.6, so I’m not sure what the exact problem is. I would check the CMake logs created by Homebrew and then see if the path to the cv2.so file is listed there. If you coming from 3.5, you may need to reinstall opencv3 with homebrew, to get it work with python 3.6. I don’t have a concrete proof about how opencv3 is brewed, but it seems to me that it looks for the current version of python and creates the “site-package” for that. So, when you upgrade your python from 3.5 to 3.6, I don’t think you can expect to have “/usr/local/opt/opencv3/lib/python3.6” created for you. But you can just link the *.so file in “/usr/local/opt/opent3/lib/python3.5/site-package”. For what it worth, I can confirm that brew install opencv3 works for my python 3.6. I was able to complete the install without any errors. I have the same issue “No such file or directory” “/usr/local/opt/opencv3/lib/python3.6”, any solution? Same here, I installed it –with-python3, but the only directory in “/usr/local/opt/opencv3/lib/” is python2.7. Just to clarify, did you use Homebrew to install Python 3? And if so, is the python3 command pointing to your Homebrew installation? I’ve got the same problem, in /usr/local/opt/opencv3/lib there is only python2.7, but no python3.6. While following the tutorial I did type “which python3” which gave me “/usr/local/bin/python3” so it seems to point to the Homebrew installation. Do you have any idea how to tackle this problem? Same problem happened to me. It bothered my nearly two days, and finally I figured out what is going wrong here, but I cannot solve it. Here is the problem, since opencv3 cannot find a suitable PythonLibs, therefore it does not install the opencv3 for python3 (e.g. the python3.6 folder in /usr/local/opt/opencv3/lib). remove python3 and start using python2 :(. Thanks for the tutorial Adrian. !! I followed the steps, and i can run opencv in python, but i cannot run an opencv example with c++ and qt-creator. Any solutions ? However, I still encounter a couple of errors as I go through – including the 3.5/3.6 ones mentioned above. I’m fairly sure this is probably the root of the rest of the errors, but I’ve not idea why it would be like this? Hey Sam — it’s great to hear that you’re enjoying the tutorial. Regarding your error, it sounds like your Python 3 path is updated, but not Python 2.7. Have you updated your .bash_profile file? And have you installed both Python 3 and Python 2.7 via Homebrew? Any updates with this? I get the same error but can’t work out why. Definitely installed both python and python3 via Homebrew. Definitely updated the ~/.bash_profile file as well. Cannot work out what’s gone wrong, looks like something in a script somewhere isn’t playing ball. Any thoughts on how to solve? Take a look at David’s reply here — it seems to have resolved the issue. I followed the whole tutorial, everything worked out, the only problem I’ve got was the binding to Python 3.6. If I open the python shell with IDLE, everything works fine. But if I open Xcode and try to import the cv2 (for c++) it doesn’t work at all, do you have any idea how to make it work there as well? I’m not sure what you are trying to accomplish here. You’re trying to import Python OpenCV bindings into a C++ program? Or you’re trying to include the OpenCV header files in a C++ program? When you tried to compile your C++ source files, you have to tell the compiler where is the Opencv header file (.h or .hpp), so that the compiler can find the header file. Note: “/usr/local/Cellar/opencv3/3.2.0/include/opencv” and “/usr/local/Cellar/opencv3/3.2.0/include” is the path where my opencv header files stored, you may have different paths. Then during, the linking process, you need to tell the compiler where is the .lib file, so that them could be linked to your final executable file. Note: “/usr/local/Cellar/opencv3/3.2.0/lib” is the path where my opencv lib files stored, you may have a different path, just change it to yours. this instruction is awsome! I installed opencv3 successfully on my mac sierra system. However now I may want to add ffmpeg surpport to my opencv3. I noticed that actually there is a –with–ffmpeg option for brew install. However I followed exactly your commands and did not add this option at that time. Now how can I add ffmpeg support without uninstalling and installing opencv3 again ? If you want to add FFMPEG support you will have to uninstall OpenCV and install it with the FFMPEG flag. I brew install ffmpeg and I uninstall opencv and re-install it with ffmpeg flag. However today when i was trying to read a mp4 file with videocapture() it always returned False, which made me doubt whether I added ffmpeg successfully. If I installed opencv with ffmpeg support correctly, where and which file ( kind like opencv-ffmpeg.h ?) should I see ? Instead of trying to enable FFMPEG from Homebrew, try compiling OpenCV from source. Thank you so much for writing this tutorial! Awesome informations! At the end of the process I get the “missing Python.h file” error. Any ideas? Have you installed the Homebrew version of Python? Also, which version of Python are you using? Adrian, thanks for the reply. Seems to be solved now, I exported a $CPATH pointing to the missing Headers folder. I think it’s working now, however, which is funny, python imports cv2, while pyhon3 imports cv3. Haven’t played with virtualenvs yet, though. Thanks for covering this tricky install so thoroughly. My Python (2&3) and OpenCV installs were damaged – I think by XCode update or other auto upgrade in Mac OS. I had to re-install Python3 from scratch and re-do all the libraries I had from before. Following this tutorial worked for me first time. Congrats on getting OpenCV installed, Neil! In general I would recommend turning off the macOS auto upgrade feature. Major OS upgrades almost always break sym-links in your development environment which is likely what happened here. Could you help with it? I correctly installed opencv3 in this way. However I wish to install the version 3.1.0 of opencv, and by following the tutorial I’m only able to get the latest 3.2 version. I have searched a lot for a way to do this, but couldn’t find something. Is it possible to choose the version we want to install? Using the automated Homebrew method I don’t think you can install specific versions of OpenCV. If you need a specific OpenCV version I would suggest compiling from source. Thank you for the reply i’ll try from source. Moreover i get a normal video speed with exactly the same script on another computer with macOs El Capitan 10.11.6 and with opencv 3.1.0_3 and python 3.5.1. So i think the slow speed may be caused by the version of opencv. Did you already have such a problem? It’s hard to say without having physical access to your system. When it comes to processing video, I would recommend Ubuntu slightly more as you’ll have better control over the package management. Other than that, I’m not sure what the exact issue would be. However, I have a quick question. When I type which python3, I get the correct directory. With which python, I only get /usr/bin/python. I have installed both python 2.7 and 3, and my .bash profile is updated. Hmm, that is indeed very strange. Make sure your source your .bash_profile. Try re-installing Python 2.7 via Homebrew and checking for any errors. Hi Adrian, thanks for tutorial. I am having the same issue as Ameya and have uninstalled/reinstalled/updated .bashprofile/sourced it, and repeated the process. Any further suggestions? Without physical access to your machine, unfortunately I’m not sure what the exact problem is. The same thing here has happened to me, $ which python returns /usr/bin/python, and $ which python3 returns /usr/local/bin/python3. Is it actually necessary that we have to make sure that we’re using the homebrew python 2.7, even if we never intend to use python 2.7? If the computer wants me to use a different python 2.7 than I installed, that’s fine, because I’m going to be using my homebrew version of python 3.5, which did correctly install. If you’re going to be using Python 3.5 exclusively, then I don’t see it being an issue. Many thanks for this tutorial. Really helped me. I am new to OpenCV. I have the source code to open an image in a window and closing it when any key is pressed. Is there an easier way to compile the code? It is very tedious to have to type this every time. Keep in mind that this is a Python blog, not a C++ blog. In any case, you should look into creating Makefiles. Thank you very much for the tutorial. I have been trying to search for comment with the same problem but I cannot find so I decided to post here to ask. I have previously installed OpenCV 2.4.12 in my OSX with brew and python 2 and 3 several months ago. I have tried the following and it worked! My terminal shows me this error while Installing OpenCV 3 with Python 3 bindings via Homebrew. What do i do? I’ve seen a few readers encounter this issue. Unfortunately, I’m not sure what the exact problem is as it seems to be related to Homebrew. I would suggest trying to install OpenCV from source. I got the same problem when installing opencv3. Then I solve the problem like this: go to the official website and download the zip code source, unzip it and you can get downloader.cmake file in 3rdparty, then you put it into the same file in opencv–git. After that try again and it will work. Thanks very much for your very helpful tutorial. But I still get some problem. First, when I follow your instruction at step4, after cloning the file from github, I got an error with a prompt: the ‘downloader.cmake’ file in 3rdparty is missing. I checked it out and found a problem. The code post on Github does not include ‘downloader.cmake’ while when I download the zip code, I found it was there. So I add that file manually and succeeded finally. Second, after I completing the installation of opencv, when I call the formula cv2.VideoCapture(path), it failed to open the video file. Now I don’t how to solve the problem out. Additionally, the video file I was trying to open is .mkv file. Can you give me some advice? This seems to be an issue with the latest version of Homebrew definition files that many readers are encountering. Try running brew update to refresh your definitions. Otherwise, you might need to install OpenCV via source. As for opening a .mkv file, it sounds like you may have installed OpenCV without MKV codec support. So how could I install it with MKV codec support? You would need to install the MKV drivers then re-install OpenCV. I haven’t tried to compile OpenCV support with MKV support before, so I unfortunately cannot provide any more guidance than this. What can I do to deal with it. Please read the comments before posting. “Nidhi” mentioned this error above and “Creekee” provided the solution. I dont see any packages for python3.6. How can I include it??? Hi I have python 3.6 installed without homebrew, but I followed rest of the case. But i do not have a python 3.x folder as mentioned in the Handling the python3 issue. I have tried mutliple things but they are not working. 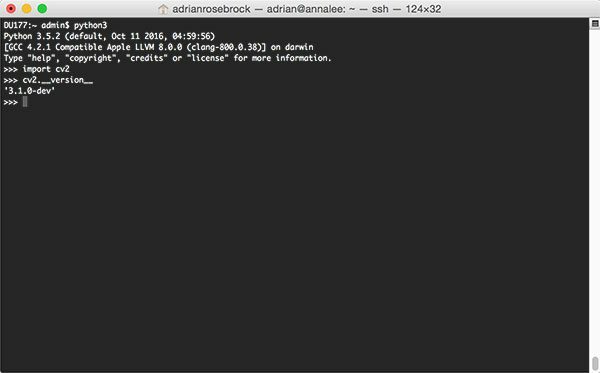 This blog post assumes you are using Homebrew and the Homebrew paths to Python 3.6. I would still suggest that you install Python via Homebrew to ensure it’s separate from your system install. “python3-3.6.1 already installed, it’s just not linked.” What does this mean?? and when using ‘which python3’ it shows /usr/local/bin/python3. And see if that resolves the issue. Thanks for your post ! Only with your tutorial did I find a way to make it work. However, it only does when I am in the /usr/local/opt/opencv3/lib/python2.7 folder and launch python from there. Then it works and I can use cv2 package (check import and version ok). That is an issue as it prevents from using my favorite editors (Rodeo or Pycharm) as they also return the same error message. Would you have some advice on how it could make it work from any folder and my editors? Hey Gilles — are you using Python from a virtual environment like I recommend in this tutorial? Or did you skip the virtual environment step? I found out what it was. ‘brew doctor’ showed python3 was unlinked, I just followed brew doctor instructions and it worked fine. Congrats on resolving the error Laura! And thank you for sharing the solution as well. 1. This was super helpful, thank you so much! 2.Your recommendation to compile from source, and use Homebrew as a fallback- that’s at the end! If I had read that first, I would have went with your recommendation, but in the beginning it sounded like this was the easier route. 3. Everything “worked” except for the very last part: testing the opencv install in the virtual environment. When I type “import cv2” I get the error message: “ModuleNotFoundError: No module named ‘cv2′”, which is odd. It works outside the virtual environment, and when I redo the step to sym-link, I get feedback: “ln: cv2.so: File exists” . I looked around stackoverflow / github, but did not see a proper solution. Hi Cory, thanks for the feedback. You’re right, I probably should have recommended compiling from source at the top of the post. As far as the sym-link existing, you can delete it using rm just like any other file. Double-check your path to the cv2.so file before you create the sym-link — that is likely where the error is. I had this issue too, but removed cv2.so with rm from the site-packages inside my virtualenv. Then relinked cv2.so using the command Adrian provided and cv2 is now imported just fine in python (when in virtualenv mode). Does it mean that OpenCV doesn’t support wrappers for both Python verions? Do I have to run it with the extra syntax –without-python to make it work and thereby sacrifice the Python 2 support? I’m quite a newbie within this field so any suggestions would be appreciated! Hi Andreas — I would make sure you run brew update to make sure the latest install definitions are pulled down. Homebrew should not have an issue compiling and installing OpenCV with Python bindings. I then tried to run brew install opencv3 –with-contrib –with-python3 –HEAD and I got the error again, really not sure what I can do to resolve the problem. Any advice or help will be greatly appreciated! I’m curious if there is an improper sym-link somewhere. Can you remove the previous Python sym-link and try again? I would also suggest reading the comment thread started by “Nidhi” above as it also addresses the same issue. Based on the two threads, it seems that there was an update to the actual Homebrew formula that’s causing the error. The solution to the problem can be found here. If you want to install with --HEAD, then you’ll need to update the Homebrew formula. I have the same issue as Andreas and my homebrew is up-to-date. Any other suggestions? I tried the solutions mentioned above for installing with –HEAD and also tried without, I still get the same error? It sounds like the issue is with the formula itself then. Please see the StackOverflow thread I linked to. Please give that a try and let us know if it works. So my thought, is there a way to not simultaneously install opencv for both python 2x and 3x at same time, and force it to only do 3x (–without-python seems to skip python all together)? Because it almost seems as if it’s now built to only handle one at a time. Hey Patrick — thanks for the comment. Homebrew would need to do two separate compiles of OpenCV for Python 2.7 and Python 3 as they are two entirely different Python versions and will thus bind with OpenCV differently. As the current Homebrew formula stands, it looks like you can compile Python 2.7 bindings, but there is a bug with the Python 3 bindings. As I mentioned to “Daniel”, I’ll have to look into this further as the Homebrew formula has clearly changed. Unfortunately, I’m having the same issue. I tried editing the formula as suggested. I’ve also tried without the contrib and head params but the failure persists on macOS Sierra. Unfortunately, I don’t have any other suggestions at this time. I will try to play around with installing OpenCV via Homebrew on a local machine, but it unfortunately seems it an issue with the actual OpenCV + Homebrew formula. Until they update the formula, the problem will persist. What do you think of this possible solution? Spontaneously it feels like there is a reason for this check in the code and simply omitting sounds like a “too simple solution”. Apparently it works for at least one user. At least the install anyway. For the moment I will install without using the –HEAD option. Hi Francis — what you do mean by “First place”? Is there a second configuration file that you’re editing outside of brew edit opencv3? I just want to make sure we’re on the same page. This will work if you need Python 3 bindings. It will not work if you need Python 2.7 bindings. I just drafted a blog post that will publish on 15 May 2017 to provide solutions to these issues. As always very good tutorial. One tiny suggestion from my end is that after Home brew install better to execute brew doctor. Great tip, thanks for sharing Francis. I was receiving an issue regarding webp. I was able to solve it by installing the webp package with homebrew (brew install webp). If you want to add FFMPEG parameters to OpenCV you would need to re-compile and re-install OpenCV. In this case, you would add the --with-ffmpeg flag to the Homebrew command. I recently updated my bash profile to show which github branch is active (master), etc. Now my command line just has a plain $ showing. It doesn’t show which virtual environment I am in… Do you know how to fix this, and also any good resources on configuring the command line. Thanks for this tutorial. Relative newb to python and coding in general. didn’t work for me. The file was still named “cv2.cpython-36m-darwin.so”. I created another symlink ln -s cv2.cpython-36m-darwin.so cv2.so” to solve it. Hi Ben — the reason the original command did not work for you is because you used Python 3.6. This blog post was written for Python 3.5. In either case, be sure to pay attention to your Python versions and filenames as they will change based on your Python version. Hi! I installed the installation following the tutorial and I was successful, but when I run the examples the images are not loaded, the highgui window opens with the command “cv2.imshow (” name “, image)” but does not show the image. This can be seen in the link below. This seems to be a bug with the latest OpenCV release in the repository. Remove the --HEAD flag from your Homebrew command when installing and it should resolve the issue. Hi Adrian… It worked perfectly … Thank you !!! Fantastic, I’m glad to hear it 🙂 And congrats on getting OpenCV installed on your system! great tutorial. Sadly, imshow() is not working. See my SO question: https://stackoverflow.com/questions/44686163/ Does anybody have some advice? Would be so thankfull. Please see my reply to “TIAGO FREITAS” above. There is a problem with the latest commit, so simply remove the --HEAD switch from your Homebrew command and it will work perfectly. Thanks Adrian! These instructions work well for MacOS 10.12.5 and Python 3.6.1. One difference is that –with-python3 now installs ONLY the Python 3 bindings. Meanwhile, using –HEAD still produces the error described on Stack Overflow. The only benefit I see in compiling from source using Homebrew is if one also desired C++ bindings and command line tools. Hi Adam — thanks for the comment; however, I have already addressed the OpenCV + Python + Homebrew issue in this blog post. Definitely give it a read. You’ll also get finer grained control over the OpenCV compile. Nothing beats compiling from source in my opinion. The guy said this is the new way ? i’m not that sure but it seemed to fix my issue. migrate formulae using .apps to casks. Any idea how to replace linkapps or fix this issue? You can skip the brew linkapps step with the latest release of Homebrew. Any ideas why “python” is not working as expected? This is due to a recent update in Homebrew which I’ll be addressing in a new macOS install post. I would suggest using either python2 or python3 (depending on which version of Python you are compiling OpenCV for) in place of python. I hope that helps! So can we leave it as it is? I mean having the stated faulty path for python and then having the correct one for python3 or do we have to completely install and change path to say python2? And once you are inside the “cv” Python virtual environment the “python” command would be aliased to “python2”. Hello. Much thanks… This is the issue i’ve been having. The which python has */local * missing. I’ve have repeated step 2 severally but still no changes. What can I do please? Although I did previously have python installed on my laptop like a year back. I have not tried installing openCV yet though since you said we should make sure this part is fixed before proceeding. Thank you again. And from there you’ll be all set! Just use brew install opencv3 --with-contrib --with-python Useless article! If you have python3 just use --with-python3 flag instead. I would disagree. Python virtual environments are a best practice in Python development. Just because we are using OpenCV does not mean we should skip using Python virtual environments. Secondly, I would recommend caution when installing OpenCV via pip. Depending on your operating system you may not have the GUI components installed (in particular the “highgui” module) which would prevent you from using OpenCV’s GUI functionality. Personally, I like to compile OpenCV from source (which you can find in all my author tutorials) which allows me to further optimize the install. If you decide you don’t to use Python virtual environments, by all means, don’t use them. But they are a best practice in Python development and I saying “most users” is a large exaggeration. I will be providing a new, updated install tutorial for macOS High Sierra soon. Stay tuned! Any update on the macOS High Sierra tutorial for opencv ? I haven’t done it yet but it’s on my radar 🙂 I have a really cool series of deep learning posts coming up and then I’ll be able to do some more install tutorials. I’m also evaluating five different ways of installing OpenCV on macOS High Sierra so it’s taking some time (as I want to report the best method). Is there any update on “brew tap homebrew/science is deprecated” issue? Thanks a lot for that awesome tutorial! Any ideas where this could come from? Hey guillaume — can you link to a GitHub Gist of the exact error message you are receiving? Thank you for sharing, Guillaume. To be honest, I have not encountered that error before. I would suggest re-compiling and re-installing OpenCV with OpenCL disabled and see if that resolves the issue. The command “$ brew install python python3” and even “$ brew install python” only installs python 3. You have to use $ brew install python2″ to install py 2.7. Mac OS 10.6 is Snow Leopard, right? To be honest I have not tried this tutorial on Snow Leopard. I highly doubt it would work — you should use a more recent version of OSX. Snow Leopard is almost 10 years old at this point. “Homebrew team lately changed the name from opencv3 to opencv”.. I struggled with “no such file….” but things magically worked perfectly after I omitted the “3” after “opencv” on all paths.. Thank you so much Adrian.. I really appreciate your generosity on sharing your knowledge with us..
linkapps was deprecated what can i do ? Any suggestion and also my python3 is in wrong direction. Can u suggest something ? You can skip the “linkapps” command as it is now deprecated. I’m working on a new, updated High Sierra tutorial as well. What is the path your “python3” is reporting? Hi Adrian, first of all for doing this installation tutorial. I’m pretty new with Python and this is the first time I’ve tried to install OpenCV in my High Sierra. I tried following the steps from another website but found it too complicated and I failed, then I ended up here. 🙂 just saying because I don’t know if the problem I have might be also for this previous try. I have followed all your steps and everything seemed to be ok, but at the last step I had a problem when testing openCv in the virtual environment. When I type “import cv2” I also get the error message: “ModuleNotFoundError: No module named ‘cv2′”. I’ve read someone else had this problem before and you recommended to remove cv2.so, so I did but still have that message. You also suggested to double check the path to the cv2.so file before you create the sym-link, which one should be the right one? Hey Tanaan, thanks for the comment and I’m sorry to hear about the issues installing OpenCV. I’m working on a dedicated High Sierra + OpenCV install tutorial but it’s not ready yet. As for your “cv2” module not importing are you sure you are in the “cv” Python virtual environment before importing? Secondly, you are correct that you should double-check your sym-link path. Your exact path may be slightly different depending on your system but you should find the “cv2.so” file in the “site-packages” directory of your system install of Python. Hi Adrian, many thanks for the quick prompt. That tutorial would be awesome, could you maybe include at the beginning how to remove any previous installation if that is the case just to be sure we do everything from scratch? 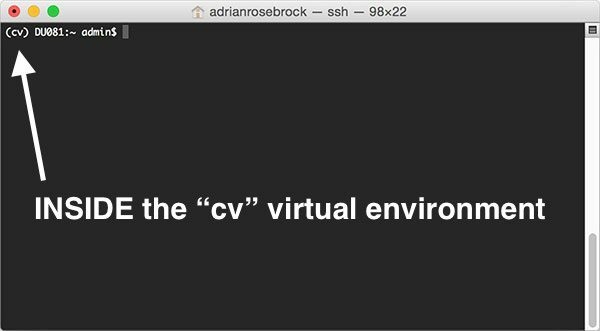 Yes, I’m totally sure I am in the virtual environment since the first thing I do in the terminal is type “workon cv”. The next line starts with “(cv)”. So I assume I’m in the virtual environment. If you installed via brew you could do a “brew uninstall opencv” which should remove any brew-based installs of OpenCV. Homebrew has become a bit more of a pain lately but your OpenCV bindings should be in the /usr/local/lib/python2.7/site-packages directory (or “python3” if you used Python 3). Hi Adrian, thanks for the tutorial. I just run the “brew install opencv3 –with-contrib –with-python3 –HEAD” code line and it appears “ERROR: no head is defined for opencv”. Any idea what is going on? I tried using “opencv” instead of “opencv3” as I saw in some comments above but still nothing. I am new on all of this, sorry if there are some rookie’s mistakes. Thanks for the help. Hey Carlos, this is not a rookie mistake. Homebrew has changed how OpenCV is installed. I’m working on a new tutorial to handle installing OpenCV. In the meantime, I recommend compiling from source. Thank you for this tutorial. I ran into some issues symlinking my opencv to the virtualenv one. This site solved a lot of my issues. Error: homebrew/science was deprecated. This tap is now empty as all its formulae were migrated. Homebrew actually deprecated the “homebrew/science” tap. I would actually recommend you follow this updated OpenCV 4 and macOS install post. For anyone else reading this comment I no longer recommend installing OpenCV via Homebrew. This post, along with my pip install OpenCV posts are my two recommended resources. I have tried to follow this but without installing the virtual environment. Firstly, homebrew/science is no longer a repo but as far as I can tell I still managed to install everything but not the symlinks because I don’t want the virtual environments. Needless to say it doesn’t work for me. If I run Python and try import vc2 it just says ‘no module named cv2’. How do I get around this. I’m not a Python developer, I just occasionally use it for quick testing. Hey Darren — you might be interested in instead installing OpenCV via pip.